The Supreme Court considers Puerto Rico’s sovereignty in Sanchez Valle. The Supreme Court grapples with America’s biggest colonial hangover: The legal status of Puerto Rico. If you were expecting a fight between the conservatives and Justice Sonia Sotomayor, you’ll be disappointed. 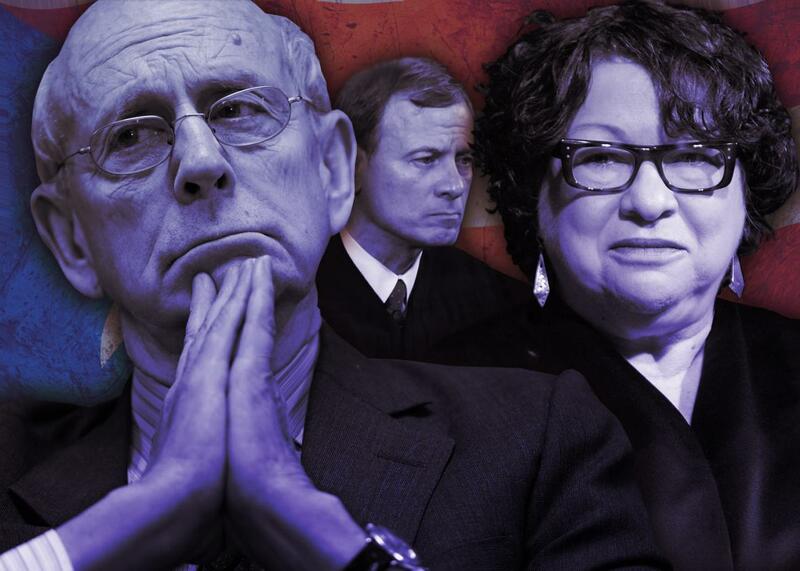 Above, Justice Stephen Breyer, Chief Justice John Roberts, and Sotomayor. Photo illustration by Slate. Photos by Chip Somodevilla/Getty Images, Alex Wong/Getty Images, and Olivier Douliery-Pool/Getty Images. What the hell is Puerto Rico? Since America came into possession of the island in 1898, different governments have called it different things at different times, including a colony, a commonwealth, a territory, a republic, and a sovereign. Puerto Rico calls itself a commonwealth in English—though it is not a commonwealth—and a “free associated state” in Spanish, though it is not a state. The United States government calls it an unincorporated territory, but a federal judge has rejected that description. The United Nations once called it a non-self-governing territory, then stopped, and now wants to start again. The only aspect of Puerto Rico’s legal status that everyone agrees on is that it is a total mess. On Wednesday morning, the Supreme Court waded into this mess with admirable pluck to see whether the Constitution can solve the mystery of Puerto Rico’s status. I should warn you now that if you were expecting a showdown between the conservatives and Justice Sonia Sotomayor—a Nuyorican with strong ties to the island—you’ll be disappointed. Wednesday found the justices on good behavior as they tried to suss out this constitutional conundrum. By the end of the morning, the justices seemed determined to settle on a compromise position that could resolve the case in front of them without doing much to soothe Puerto Rico’s existential woes. That case, Puerto Rico v. Sanchez Valle, is an admittedly weird vehicle for determining the island’s status, since it’s technically about double jeopardy. Courts have long held that the Fifth Amendment’s protection against double jeopardy—being tried for the same crime twice—doesn’t apply to successive trials by “separate sovereigns.” (That’s just a fancy term for states and the federal government.) This “separate sovereigns” doctrine means, in practice, that both states and the feds can try a defendant for the same offense—states under state law, the feds under federal law. The idea here is that the 10th Amendment preserves the states’ right to prosecute criminals under their own laws, no matter what the federal government does. Sanchez Valle presents a question that flows logically from this theory: Is Puerto Rico also a “separate sovereign”—at least for double jeopardy purposes? If the court says yes, the ruling could trigger political shock waves, forcing the U.S. government to reconsider its legal relationship with the island, which it now treats as a mere territory. If the court says no, its decision could endorse a kind of colonialism that many Americans thought their country abandoned long ago. Nobody grasps the political implications of Sanchez Valle better than Justice Stephen Breyer, who seems delighted by the high-stakes intellectual puzzle of the case. Early on, Breyer declares that “the political implications I’ll just stay away from,” then proceeds to discuss them at great length. Breyer is concerned because America pinky-promised the U.N. in 1953 that Puerto Rico was sovereign, or at least sovereign enough. It did so to avoid a pesky requirement that countries submit annual reports on the development of their nonsovereign territories. And it persuaded the U.N. to sign off on the plan because Congress and the president approved, in 1952, a Puerto Rican Constitution that allowed the island to govern itself. Breyer is convinced that this series of events gave Puerto Rico a significant amount of sovereignty, for two reasons. First, the United States Constitution gives Congress total power to “make all needful rules and regulations respecting” territories. Since Congress approved the Puerto Rico Constitution—and that constitution granted Puerto Rico significant sovereignty—didn’t Congress implicitly approve that sovereignty, too? Second, the U.S. swore to the U.N. in 1953 that Puerto Rico had been “invested with the attributes of political sovereignty, which clearly identify the status of self­-government.” Breyer believes this declaration proves Puerto Rico has been somewhat sovereign since at least 1953. Justice Antonin Scalia—who believes international law is a big jar of pure applesauce—allows Breyer to wax sentimental about his beloved U.N. for roughly two minutes before jumping in with a puckish grin. “This is what we told the U.N.,” a frustrated Breyer responds. “Who is ‘we’?” Scalia retorts. Breyer tries to resume his lecture, but his thoughts are a whirlwind of discombobulation. Luckily for Breyer, Justice Anthony Kennedy, the philosopher-king of Salzburg, is also plainly fascinated by the international law component of the case. Christopher Landau, the attorney for Puerto Rico, floats the idea that the justices recognize the island as a semisovereign for constitutional purposes, largely autonomous but still ultimately answerable to Congress. That would allow courts to treat it like a state for double jeopardy purposes, thereby permitting the Puerto Rican government to prosecute Sanchez Valle. Kennedy asks whether Landau is supporting “second-class sovereignty” for Puerto Rico. Kennedy is clearly troubled by the singularly bizarre status of Puerto Rico and seems interested in bringing the relationship between the island and the U.S. government in line with international norms. The same cannot be said of the other conservatives who speak on Wednesday, Roberts and Scalia. Roberts’ view of the case seems to be this: Because Congress approved Puerto Rico’s constitution—and could theoretically repeal it—the island has no true sovereignty. All its autonomy was granted by Congress, and what Congress giveth, Congress may taketh away. This view aligns Roberts with Sanchez Valle: If Puerto Rico isn’t a real sovereign, then the island’s government can’t prosecute him, since the federal government already has. Scalia has an even simpler approach. The Constitution, he notes, recognizes states and territories—and nothing in between. If Puerto Rico wants actual autonomy, it should commence the process of securing statehood. Until then, it must make do with whatever scraps of sovereignty Congress throws its way. In attempting to make this point to Nicole Saharsky, the Justice Department attorney arguing against Puerto Rico, Scalia accidentally sounds antagonistic. When Scalia suggests that Congress pass a law saying the federal government won’t prosecute a crime already prosecuted in Puerto Rico, Saharsky sounds nervous and deflects. Is this a trap? Finally Scalia leans in and beams an avuncular smile. “I’m trying to be helpful!” he declares. Everyone, including Saharsky, laughs. Isn’t it sweet to see Scalia and the Obama Justice Department getting along? In the end, the most revealing thing about Wednesday’s arguments was what wasn’t said. Later this term, the court will decide whether Puerto Rico can restructure its debts, an authority granted to all 50 states. The sovereignty issue looms large in the background of that case too: In lower courts, Puerto Rico insisted that, by depriving the territory of restructuring power, Congress infringed upon its sovereignty. Everyone was terrified that Wednesday’s case would be a trap door into that one; Sanchez Valle’s attorneys even called their own case a “Trojan horse” to push the court toward allowing debt restructuring. But a majority of the justices seemed inclined to solve Sanchez Valle with a pragmatic quick fix and leave Puerto Rico’s broader ontological woes for another day. Sotomayor best articulates this solution, asking whether the court could hold that “for Double Jeopardy Clause purposes” alone, Puerto Rico is a sovereign. After all, the island has indisputable authority to “determine what shall be an offense against their peace and dignity,” and punish any offenders. Isn’t that enough sovereignty to resolve the double jeopardy question? If Sotomayor can grab Kennedy’s vote on her compromise, then that’s the ballgame. It’d probably be for the best, but it’d also be a little tragic. For more than a century, the United States has trifled with Puerto Rico, repeatedly pledging to expand its sovereignty—then reneging when it counts. The statehood movement is growing on the island, as more residents recognize that the current arrangement may be the worst of both worlds. And yet, the federal government still treats the territory like a glorified colony, as Congress delays voting on debt relief at the behest of hedge fund billionaires. The Supreme Court likely can’t force the government to recognize Puerto Rico as the de facto state it is becoming. But it can help make the territory a little more equal.